As kids head back to school, parents are preparing for the year ahead and wanting to ensure the best possible educational outcomes for their child. There’s no doubt that learning and understanding reading, writing, spelling, comprehension and general literacy play a huge role in a child’s overall educational success, as well as setting a strong foundation for their adult life. Phonics plays an important role in learning to read in the classroom, and studies have found that synthetic phonics is the best way to teach kids to read, write and spell. But what is synthetic phonics? 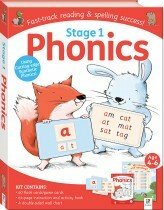 The phonics system many parents remember from their school days is called analytical phonics. This method teaches individual letter sounds using picture clues. With analytical phonics, children learn reading and spelling separately. Synthetic phonics focuses on pronunciation of letters and letter combinations and is an intuitive, fast form of teaching phonics that teaches reading and spelling at the same time, instead of separately. In English, there are 26 letters in the alphabet, each with their own sound letters (which are called phonemes). However, English is made up of more than just individual letter sounds – there are 44 sounds in the English language overall. We combine letters to represent sounds (such as ‘sh’ in ‘ship’). So, multiple letters can be used to represent a single sound (which are called graphemes). A single sound (phoneme) can be represented by one, two, three or four different letters. For example, the phoneme /s/ is spelled using a single ‘s’ (as in in ‘sat’) and two ‘ss’ (as in ‘glass’. A single sound (phoneme) can also be represented by different spellings (graphemes). For example, the sound /c/ can be spelled using the letter ‘c’ (as in ‘cat’) and using the letter ‘k’ (as in ‘kite’). One spelling (grapheme) can represent multiple sounds (phonemes). For example, the spelling ‘ea’ is pronounced /e/ in ‘bread’ and pronounced /ee/ in ‘bead’. 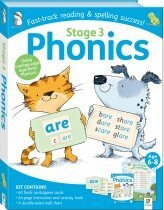 Synthetic phonics helps your child learn to blend or synthesise these sounds to read a word. And in reverse, they can separate or segment sounds and blends to spell a word. If your child can sound out a word, they can also read it and spell it! Parents can help assist their child’s learning at home. But how can parents teach synthetic phonics at home? Hinkler’s comprehensive Synthetic Phonics series of three kits together form a three-part program for learning synthetic phonics. 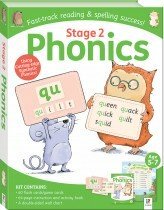 These kits have all you need to help your child begin to learn to read, write and spell, and will guide them step by step through the synthetic phonics method in a clear, accessible and fun way. As children master new knowledge and skills, they can move to the next stage in the series. Each Synthetic Phonics kit contains a 64-page instruction and activity book, 60 double-sided flash/game cards and a double-sided wallchart. Written by former school teacher, literacy advisor and successful children’s author Louise Park, this series is comprehensive and in line with cutting-edge curriculum, while still being accessible to parents. Plus, it's super fun for kids! The activity book is designed to make learning fun and low-pressure, with oodles of learn-as-you-play activities. Kids feel rewarded as they progressively read and write new words with ease. Each page is designed to engage kids, with fun scenes and illustrations and a wide range of different tasks, from colouring, drawing and matching activities to completing whimsical nonsense poems and making their own mini books! The double-sided wall chart is a perfect at-a-glance summary and tool for learning-reinforcement. On one side are all the phonemes and their matching example word covered in each kit, and on the other are irregular (or ‘sight’) words, which need to be rote-learned. The kits also include an exclusive code to log in to our online aural support system, so children can hear the sounds they are learning to ensure correct pronunciation. Here some tips to ensure your child gets the most out of learning with Hinkler’s Synthetic Phonics series. Be sure to work with your child at a time of day when he or she is not tired, and never use the cards or activities as punishment. Use the chart as a daily visual reminder. Display it at your child’s eye height and let them revisit both sides again and again. The chart also makes a great reference guide as you work through the activity pages with your child. Work through the book together and have fun. The more kids practise, the more they retain! Laugh together! Learning to read and spell can be an anxious process for some children –your positive attitude will help your child relax and enjoy learning. We wish you and your child a successful, happy school year!